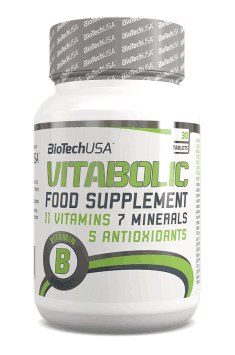 Biotech Vitabolic is a vitamin and mineral preparation designed for sportspeople and physically active people. The balanced combination of components was carefully selected in order to support the organism’s capacity, performance and immunity as well as to support the development of lean muscle mass in intensively training people. The vitamin complex with antioxidant properties, which contains vitamins A, C, and E, helps to prevent the toxic activity of free oxygen radicals and lipid peroxides. Vitamin A participates in the process of proper vision and skin regeneration. Vitamin C participates in the synthesis of collagen, neurotransmitters, and prostaglandins. Vitamin E protects lipoproteins from oxidation and strengthens immunity. The total amount of the vitamins determines the organism’s antioxidant potential, which is of great value in terms of preventing diseases of affluence. Vitamin D plays an important role in regulating the calcium and phosphorus management in the organism, that way determining normal bone mineralisation and preventing osteoporosis. It increases the level of antioxidant glutathione and performs neuro- and cardioprotective functions. The complex of B vitamins, which contains thiamine, riboflavin, niacin, vitamin B6, B8 (inositol), B9, B10 (PABA) and B12, determines the normal functioning of the nervous system. The vitamins also play an important role in energy processes in the organism. As components of many enzymes, they affect biochemical transformations of proteins, lipids and carbohydrates as well as essential neurophysiological functions. Macroelements – calcium, iron and magnesium are elements crucial for the normal functioning of the organism. Calcium is a structural element of teeth and bones, participates in hormone biosynthesis, and is essential for the health of the nervous and muscular systems. As it can be found in different oxidation states, iron performs enzymatic functions and is an important element of respiratory enzymes, peroxidase, catalase, and haemoglobin. Magnesium takes part in the formation of teeth and bones, the production of energy, it activates numerous enzymes, and is responsible for the normal functioning of the nervous system. Microelements – zinc, iodine, copper, and manganese are also crucial for the organism; however, the body needs smaller amounts of them than of macroelements. Zinc participates in the stages of protein biosynthesis, regulates the expression of some genes, forms insulin, and strengthens the immune system. Iodine is found in thyroid hormones: thyroxine and triiodothyronine, which regulate energy metabolism in the organism. Copper and manganese perform enzymatic functions. Copper is a cofactor of many enzymes, including superoxide dismutase, and takes part in the synthesis of some neurotransmitters and collagen. Manganese is essential for the synthesis of thyroid hormones and affects the functioning of the brain, and its deficiency can have a negative effect on growth and fertility. Choline bitartrate is a precursor of the production of acetylcholine, a key neurotransmitter in the cholinergic system. Choline also forms cell membranes. It is essential for the formation of neurolemmas, which protect neurons and determine normal impulse transmission. Moreover, it helps to retain L-carnitine in the organism, that way increasing adipose tissue burning, the organism’s capacity, and energy levels. Rutin is an active bioflavonoid with powerful antioxidant properties. Thanks to those properties, rutin stabilises cell membranes, protects sensitive lipids against peroxidation, inhibits inflammatory processes, and reduces the risk of developing cardiovascular system diseases and cancer. Rutin also has a positive effect on the condition of the tissues that contain protein, such as connective tissue (elastin and collagen), that way strengthening bones, tendons, and joints. Moreover, it seals the capillary endothelium and reduces its permeability, thanks to which the susceptibility to bruises, swelling and bleeding significantly decreases. Citrous bioflavonoids are a group of natural polyphenol compounds obtained from bitter orange (Citrus aurantum). They exhibit antioxidant, anti-inflammatory, and blood vessel-strengthening properties, so they can be applied in the therapy of cardiovascular system diseases. Moreover, bioflavonoids protect cell membranes from damage and exhibit synergy with vitamin C.
To sum up, Biotech Vitabolic is a complex preparation recommended particularly for physically active people, athletes, during the stage of muscle mass development, and in order to ensure perfect post-workout regeneration and stronger immunity. As a dieatary supplement, take 1 tablet daily. Physically active people also exhibit relatively higher demand for vitamins and minerals. This complex preparation is a convenient solution that provides all the necessary components in one tablet. Microcrystalline cellulose, hypromellose, magnesium stearate, stearic acid.